There is an increasing trend towards the use of varnishing blankets on sheet-fed presses. For this application we have developed Grand Canyon, a blanket that meets all requirements for spot and full-surface coating. The compressible layer guarantees easy, perfect cutting – whether this is done manually or using a plotter. The specially developed 4-ply carcass guar antees the continious use of Grand Canyon. 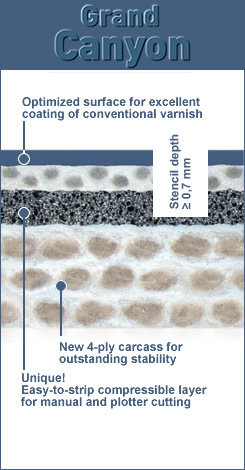 Equally suitable for UV- and aqueous varnishes through a newly developed face compound. Guarantees perfect gloss in both applications. Grand Canyon guarantees the user a stencil depth of ≥ 0,7 mm.